Posted on Fri, Sep 28, 2012 : 5:42 a.m.
It’s a tale with a happy ending: a centuries-old tradition, on the verge of extinction, rescued at the last hour by devotees who would not let it die. That’s what happened to choral music from the area we know today as the Republic of Georgia. Declared a “masterpiece of the spiritual treasury of the world’s ‘non-material’ culture” in 2001 by UNESCO, Georgian music—the sacred hymns, the secular songs, all highly polyphonic—almost didn’t make it into the 20th century, let alone the 21st. Among the latest to keep the flame alive are the members of Basiani, the all-male Georgian choral/folk ensemble whose 2010 appearance at Lincoln Center’s Mostly Mozart Festival “stole the main show,” according to New York Times critic James Oestreich. Thursday evening, the group makes its Ann Arbor debut at a University Musical Society performance at St. Francis of Assisi Catholic Church. 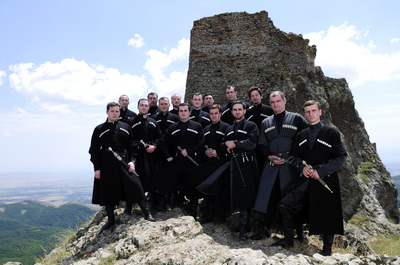 To find out more about this remarkable group, founded in 2000 as an outgrowth of the Holy Trinity Cathedral Male Choir in Tbilisi, Georgia, we turned to Zurab Tskrialashvili. A member of the cathedral choir since 1999 and of Basiani since 2002, Tskrialashvili took time to answer questions put to him via e-mail. Q. Could you say a few words about the repertoire the group will perform in Ann Arbor? Is it all folk repertoire? And from all over Georgia? And from when does it date and what makes it distinctive? Who: All-male choral/folk music ensemble. What: Georgian polyphony is a specialty. Where: St. Francis of Assisi Catholic Church, 2250 E. Stadium Blvd. How much: $25 and $35, UMS Michigan League Ticket Office, 734-764-2538, and online at ums.org. A. The repertoire we perform is Georgian traditional sacred and secular music. Those are Georgian folk songs and church hymns. We always do try to choose the program which consists of the songs from different parts of all Georgia, to show to public the diverse music that characterizes each corner of the country Georgia. Quite different and unique harmony, music language and performing style make Georgian traditional music distinctive. Though the roots are deeply seen in the ancient times, the repertoire we perform now could be considered as coming from the Middle Ages! The first live recordings were done in 1901 by the 90-100-years-old authentic Georgian performers which had been taught by the ancestors and forefathers. So it leads us in deepness of ages. I mention this because the repertoire we perform is directly revived from the recordings I noted. At this the church music to be considered as Old Georgian Professional Music has its own unique development way, which begins alongside with Christianity in Georgia and reaches the peak of development in the 10-12th centuries! Q. How is the material collected and learned? Do you have someone who arranges it? Is it music of an oral tradition or all written out and notated? A. Georgian traditional folk songs as well as the church hymns have been passed from generation to generation by the oral tradition during the ages. Since the 10th century Georgian chanters used musical symbols, the so-called “neumes,” to help them memorize the melody; this type of written musical language differs from the Byzantine one. Unfortunately the key is not yet found to decipher above-mentioned “neumes”! From the beginning of the 19th century, when the autocephalous status of the Georgian Church was abolished by Russia, Georgian chant was replaced by Russian so-called Partesnoe Peniye—and Georgian chant was seriously threatened. Georgian public figures—the Karbelashvili brothers, the Dumbadzes, Razhden Khundadze, Pilimon Koridze, Ekvtime Kereselidze and others—took upon themselves the hard task of transcribing over 8,000 examples of Georgian chant. Since this period the notated hymns are the main source of studying them from, alongside the small quantity of old singers’ live recordings, made at the period of beginning-to-middle of 20th century. As for the folk songs, there are a lot of materials, including audio/video tracks and notated songs, which become the main teachers for the group. Also the regions still keep the people who are the successors of oral singing traditions—so we keep the close relationship with them, studying quantity of patterns. Q. It would be great if you could also say a few words about Georgian polyphony and what makes it distinctive. A. The unique three-part musical language, different harmony, distinguished performing style, complicated composing structure and high developed polyphonic thought make Georgian polyphony distinctive. The witness of this easily could be the cases such as: increasing interest in Georgian polyphony of the foreign researchers; creating the Georgian singing choirs by the foreigners themselves in France, UK, Canada, Australia etc. ; international acknowledgement of Georgian polyphony by UNESCO in 2001; sending of Georgian song “Chakrulo” to the space by the Americans in 1977, as a part of humans’ high-music civilization; and the last—performing Georgian polyphony at Lincoln Center’s Mostly Mozart Festival alongside the J.S. Bach’s compositions in 2010!